These are the "1 Piece Plug" and Universal Wiring Harnesses. The 1 Piece Plug made its debut with the MDII Mount. The MDII made it necessary to unplug EACH plow light, the 3 individual Coil wires, and the Motor Harness to remove the complete plow assembly. Meyer came out with the 1 Piece Plug. The very first consisted of a short truckside harness that the individual wires could be plugged into, and a plowside harness that would connect to the E-47H, E-57H, or the E-60H. 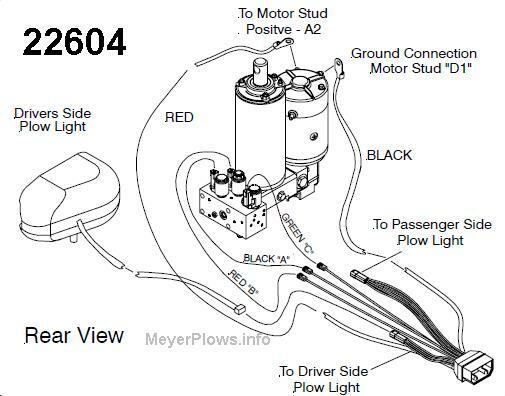 Once it was clear moving forward that the whole plow assembly would be removed as a unit, the 22261 Truckside Harness evolved into the 22610 truckside harness. The Touchpad Controller was standard, so the harness had a plug for the Touchpad in the cab. There was also the debut of the E-58H around the same time, so a hydraulic side harness (22604) for that came out. Next came the Pistol Grip 22690 Controller. Since the 22691 Universal Harness was already in use on the Xpress Plows, it made sense to use the same harness, in fact, it became the Universal Harness. So the plug in the cab changed to the Universal Pistol Grip plug. This way it would be used with the E-58H, the Xpress Plows, and even the V Plows. Naturally now that the truckside had a round plug, the various plowside harnesses came out as well. Finally! Now we are up to what is current! 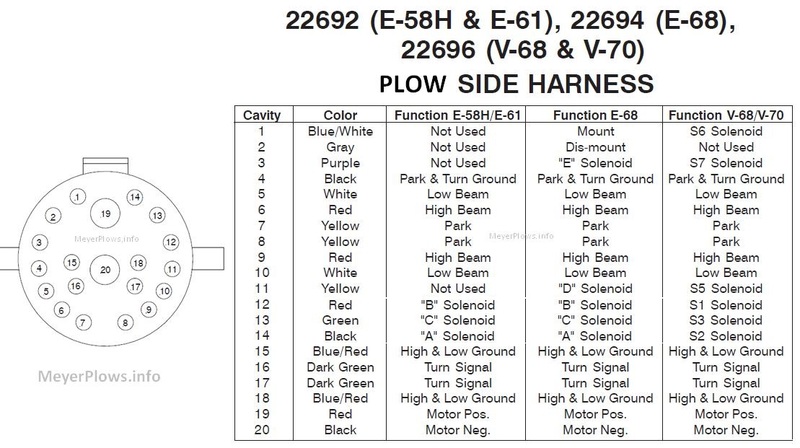 Now, here are the pin outs for all of the above harnesses to aid in wiring and troubleshooting your Meyer plow wiring. OEM Meyer Truck Side plug and wiring harness for MD II and EZ Plus mounting with E-47, E-57, E-58H, or E-60 pumps. THIS IS THE TRUCK SIDE ONLY. Power, ground, lights, and a complete long harness into the cab for the touchpad controller. 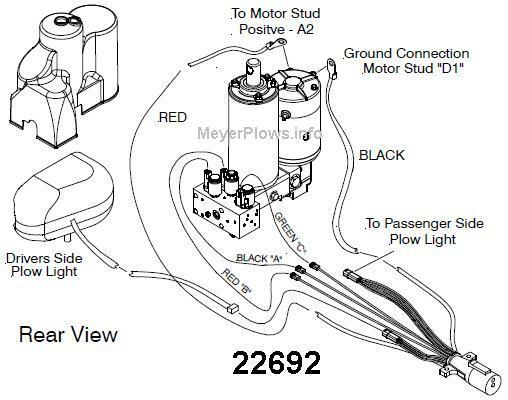 Genuine Meyer PLOW Side plug and wiring harness for MD II and EZ Plus mounting with E-47, E-57, or E-60 pumps. It has a power, dual ground wire for the E-60, single wire Coil connections Red, Green, Black, 2 Nite Saber plugs. 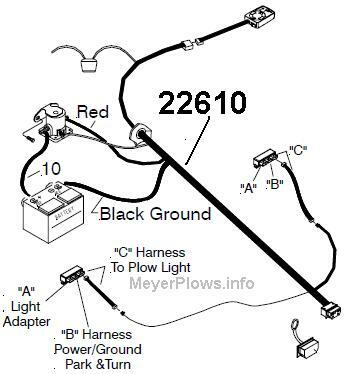 OEM Meyer Rectangular PLOW Side plug and wiring harness for MD II and EZ Plus mounting with E-58H. THIS IS THE PLOW SIDE ONLY. Power, ground, lights, and dual wire coil plugs. ONLY FITS E-58H Unit. OEM Meyer Round PLOW Side plug and wiring harness for MD II and EZ Plus mounting with E-58H. THIS IS THE PLOW SIDE ONLY. Power, ground, lights, and dual wire coil plugs. ONLY FITS E-58H Unit. 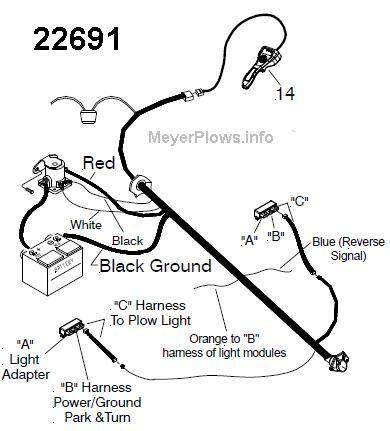 OEM Meyer Round Xpress (E-88 / E=68) PLOW Side plug and wiring harness for XPRESS PLOW ONLY. THIS IS THE PLOW SIDE ONLY. Power, ground, lights, and dual wire coil plugs. ONLY FITS E-68 / E-88 Units. Replacement Hinge Cap for Universal Harness used on Xpress plows, and ALL current plow systems. Carefully cut off the old broken cap, install this new one. No need to replace the whole harness like in the past. Repair End Socket for 22691S that screws onto 22691S Split Harness. ONLY fits 22691S, not the older 22691. For 22691 repair end see Related Products or search M08059. Scroll through ALL images to be sure you are buying the correct part. Some information on Meyer Touchpad wiring. 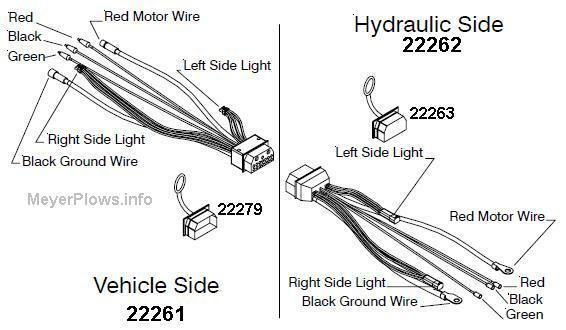 Some information on Meyer Slik Stik wiring.